“Theatre Staff Nurse | King Faisal Specialist Hospital, Riyadh! Excellent tax-free income | 54 days annual leave | Free & secure furnished accommodation | Free medical insurance & emergency dental | and much more!” Online advertisement (7 May 2014). There has been volumes written recently about the amount of Health Care Workers who been impacted by the Middle Eastern Respiratory Syndrome (MERS-CoV) in the past month after a surge of Saudi Arabian cases in April. Given the discussion I thought I might add my two cents worth. 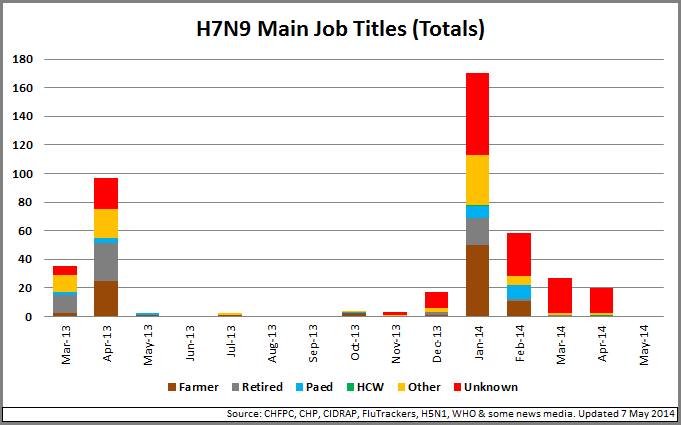 Farmer (21.4%): It is thought that H7N9 is spread primarily by the handling and eating of incorrectly cooked poultry so the publically sourced information on occupation type has focussed on farming as a key vector for H7N9. Retired (14.3%): Chinese retirees have been adversely impacted by this disease, it is thought because they take on significant family responsibilities such as shopping (at live markets) and cooking. Paediatrics (6%): Any children reported between 0 – 14 years of age. HCW (0.5%): Health Care Workers of any description. Often a good indicator of secondary infections potency. Other (18.6%): All other occupations that have been publically released. 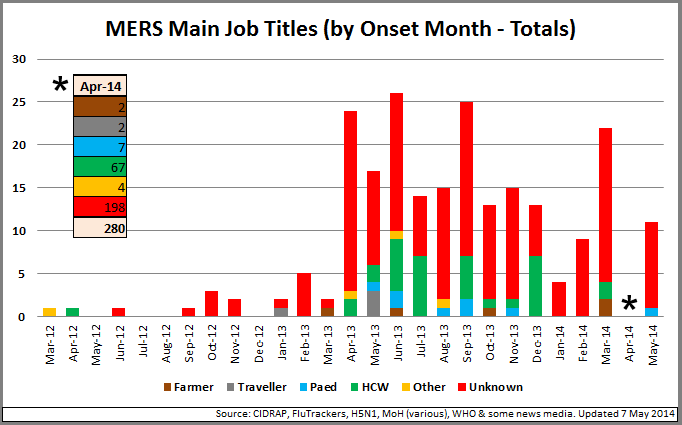 Farmer (1.4%): It is thought that MERS-CoV is initially spread by the handling of camels. Traveller (1.2%): One of the great concerns was of pilgrims and tourists spreading the disease far and wide. Although not a primary occupation while on pilgrimage or holiday you are not working so created a new non-employment type for this activity. Paediatrics (2.8%): Any children reported between 0 – 14 years of age. HCW (20.4%): Health Care Workers of any description. Often a good indicator of secondary infections potency. Other (1.6%): All other occupations that have been publically released. To the best of the Flublogia community’s knowledge, the Chinese medical authorities have worked very diligently on updating the World Health Organisation on key information. Many WHO updates have included an update on individual cases exposure to chickens and if there occupation was farming. Some provincial governments also release more detailed information which includes the person’s occupation. One of my issues with the Chinese occupational data is the level of detail, especially around farming (my whinge can be found here). The fact that Health Care Workers dominate the occupational space in MERS-CoV is important but given that HCW are usually secondary infections it is not as important as finding a possible primary occupational vector. An example of a primary occupation might include farming or racing, especially those that might relate to the camel industry. If you are going to explore the surge in Health Care Worker cases then start to limit the use of the term ‘Health Care Worker’. Health Care Workers are legion in titles, roles, functions and job families. Without going into detail about grades a great example would be a Nurse with specialities in A&E, Aged Care, Child Health, Community, ICU, General, Midwifery, Neo-Natal, Paediatric, Psych and Theatre. I commenced this blog with a live job ad for King Faisal Hospital in Riyadh looking for Australian and New Zealand Theatre nurses (Registered, two years minimum Theatre experience). To sum up, the attention given to Health Care Worker cases in the current MERS-CoV outbreak and the almost 7 out of 10 lack of detail on other occupations might make for scary charts but it is not the main game. Stop MERS in the field and you stop MERS in hospitals. I also wanted to list some other ongoing concerns I have with the level of information coming out about H7N9 and MERS-COV as it relates to occupation data. The level of occupation data supplied by China has dropped significantly in 2014. I note that to the end of 2013 that information was publically available for 75% of all cases but over the past four months that figure has dropped to 60%. Of the past 50-cases occupation have only been supplied on 5 (just 10%). The Kingdom has buried any mention of pilgrims catching the disease and the only real confirmations come from those who travelled to or through Saudi Arabia and returned to Europe, Tunisia or Malaysia. 1.2% for pilgrims and tourists is way to low and I would expect that a fair section of the unknown(s) is in this category. I’ll continue to chase up. I noted that I could account for five ‘Farm Owners’ but of all the cases I can only identify one ‘Shepherd’. Where are all the farm employees on this list? (My guess is they could lack access to medical facilities as they are more likely to come from poorer migration countries). On that note, The Guardian recently released a story detailing the almost 1,000 construction workers who have already died building the FIFA World Cup facilities in Qatar. One of the main causes of death listed is a heart attack. Many of these workers live in cramped and neglected accommodation (if it can spread in hospitals…) As yet I haven’t seen any construction occupations included in the publically available information. Could there be Qatari migrant workers dying of MERS and not being investigated. Although the previous KSA Ministry of Health news releases were noted for their lack of content one change that should be noted is that under the new system the difference between citizen and resident cases is no longer being noted. In a country that is made up of 20% foreign workers linking this data (along with expatriate country) can be critical in seeing patterns, such as issues with secondary hospital infections. There is more but that’s enough for now.